Brighton manager Chris Hughton said "it could have been worse" after his side were thrashed 5-0 at home by Bournemouth. The Seagulls' Anthony Knockaert was sent off in the second half for a reckless tackle on Adam Smith, with his side already behind to goals from Dan Gosling and Ryan Fraser. Further goals from David Brooks, Callum Wilson and then Junior Stanislas in injury time sealed a result that leaves Brighton one place above the relegation zone. "In the end it was about keeping that score down. The fear is - it could have been worse," said Hughton. The Seagulls are five points above next-placed Cardiff, who visit the Amex on Tuesday, 16 April. "I think it was one of the poorest performances since I've been here," added Hughton, who took over at Brighton when the club were near the foot of the Championship in December 2014. The Cherries won for only the fourth time away from home this season, with their other victories on the road coming at Watford and relegated Huddersfield and Fulham. Brighton did not get an effort on target until the 91st minute, when Bernardo's header was easily saved by Artur Boruc. If Brighton's run to the last four of the FA Cup had taken their minds off their league position for a short while, this performance and result will have brought reality crashing back. Not even being on home turf would have brought much solace, with just six wins and only 17 goals scored in 15 league outings at the Amex this season prior to kick-off. Hughton was furious when Gosling was given the time to line up Bournemouth's first, but the way he blanked Knockaert as the French midfielder walked into the tunnel following his red card also spoke volumes for what the Seagulls boss now has to contend with. The collapse in morale both on the field and in the stands following Knockaert's dismissal means that Cardiff's visit on Tuesday, with the Welsh club five points behind, now takes on even more significance. 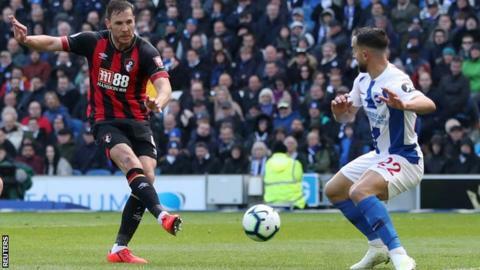 Bournemouth started the match 10 points and four places above the relegation zone, but for manager Eddie Howe this was not a position of safety. Defeat at home by Burnley a week earlier prompted Howe to state his side "could not take any liberties" following the result, the latest in a poor run of one league win in nine since the start of February. But after soaking up what little Brighton had to offer in the first 30 minutes, Howe's side took control when a slick exchange of passes between Gosling and Wilson ended with Gosling scoring his first goal in over a year. Fraser's seventh goal of this season had a touch of luck, with the Scot slipping over as he shot from outside the penalty area to make it 2-0 to Bournemouth. The impressive Fraser helped put the result beyond any doubt with key contributions in the build-up to Brooks' and Wilson's goals. Stanislas' clincher in stoppage time gave Bournemouth their biggest-ever away win in nearly four full seasons in the Premier League. Brighton manager Chris Hughton: "We came up against a very dynamic Bournemouth side and couldn't handle them. "We are in a fight at the moment. Our form is very up and down. This was on the back of a very good performance last week. We have to show our character on Tuesday. Once the players cross that line it's only them who can do that." On Anthony Knockaert's red card: "It was a reckless challenge. It was the right decision. I've spoken to the team and I think it was one of the poorest performances since I've been here. Especially knowing the qualities of the team we were playing against." Bournemouth manager Eddie Howe: "The frustrating thing for us is finding that consistency. We attacked with devastating intent at times. It's a really good win but the longer term thing is finding that consistency. "We're pleased with some of the goals we scored today. We countered with devastating effect in the second half so I'm really pleased. "We restricted them to only a few chances and we know if we can do that to teams then we can hurt them. "We've been hesitating and spluttering in recent weeks so it's good to get back into the groove and show what we can do." Bournemouth's Ryan Fraser and Callum Wilson have combined for 11 Premier League goals this season, the most by a duo in a single campaign since Alan Shearer and Mike Newell in 1995-96 (also 11). Brighton have lost consecutive home games in the Premier League for the first time ever. Bournemouth are unbeaten in their last 10 league games against Brighton, winning six and drawing four. Brighton have lost at home in the league by a 5+ goal margin for the first time since a 2-8 defeat against Bristol Rovers in the third tier in December 1973. Since promotion to the Premier League ahead of 2015/16, Bournemouth have seen their opponents receive 16 red cards, more than any other side in that period. Bournemouth's Callum Wilson has been involved in five goals in his three league appearances against Brighton at the Amex stadium, netting three and assisting two. Bournemouth winger Ryan Fraser has scored seven and assisted 12 goals in the Premier League this season, the most goal involvements by a Scottish player in a single campaign since Charlie Adam in 2010/11 (20). Brighton face fellow strugglers Cardiff at home on Tuesday, 16 April, with a 19:45 BST kick-off. Bournemouth play relegated Fulham at home on Saturday, 20 April, at 15:00. Goal! Brighton and Hove Albion 0, Bournemouth 3. David Brooks (Bournemouth) left footed shot from the centre of the box to the bottom right corner.